Since 2011 NC Campus Compact has convened Presidents/Chancellors to discuss the role of Presidents in the development and institutionalization of higher education community engagement. The Forum is typically held in conjunction with the PACE Conference. Questions? Contact Leslie Garvin. RSVP by January 16 at nccc@elon.edu. The Education Trust is a national nonprofit organization that seeks to identify and close opportunity and achievement gaps, from preschool through college. King served in President Barack Obama’s cabinet as the 10th U.S. Secretary of Education. In tapping him to lead the U.S. Department of Education, President Obama called King “an exceptionally talented educator,” citing his commitment to “preparing every child for success” and his lifelong dedication to education as a teacher, principal, and leader of schools and school systems. As AASCU's president, Dr. García is an advocate for public higher education at the national level, working to influence federal policy and regulations on behalf of member colleges and universities. She is the first Latina to lead one of the six presidentially based higher education associations in Washington, D.C. Prior to joining AASCU, Dr. García served as the president of California State University, Fullerton—the largest university in the CSU and the third largest university in the state. President García previously served as president of CSU Dominguez Hills where she was the first Latina president in the largest system of public higher education in the country. Before her arrival in the CSU, President García served as the CEO of Berkeley College where she was the first system-wide president for all six campuses. She has held both academic and senior-level positions at Arizona State University; Montclair State University; Pennsylvania State University; Teachers College, Columbia University; and the Hostos, LaGuardia, and City Colleges of the City University of New York. A first-generation college student, Dr. García earned a Doctor of Education degree and a M.A. in Higher Education Administration from Teachers College, Columbia University; a M.A. in Business Education/Higher Education from New York University; a B.S. in Business Education from Baruch College, City University of New York; and an A.A.S. from New York City Community College. She actively promotes partnerships between U.S. higher education institutions and societal, cultural and higher education systems of other countries. She has participated with the Fulbright-Hays Seminar for Presidents in 2011, in Jordan and Oman, as well as attended the Fulbright IEA Seminar in 2017, in France. She has also participated in the Fulbright Scholar Program in 2018, including speaking at the 70th anniversary of the Fulbright Commission Franco-Américaine, in France. Jeremy Anderson is the president of Education Commission of the States, a national education policy organization that serves as a partner to state policymakers. In his role, Anderson works with all state education leaders, from governors to chief state school officers – from both political parties – to provide unbiased information, personalized support and opportunities for collaboration. Prior to joining the organization in 2012, Jeremy built a strong public service record working with officials in Washington, D.C., with many governors and legislators in states and with education policy organizations around the country. About Education Commission of the States: Education Commission of the States is a nonprofit organization that serves as a partner to state policymakers across the 50 states, District of Columbia and territories. The organization compiles research on education policies from early learning through postsecondary and workforce, and regularly issues relevant and timely reports providing education leaders with concise, factual overviews on these topics. Education Commission of the States’ policy experts provide unbiased advice on policy plans, consult on proposed legislation, and testify as third-party experts at legislative hearings and interim committees. Education Commission of the States believes that the most effective policy occurs when all state education leaders are involved and actively convenes state leaders within their states and across states to interact, collaborate and learn from each other. A block of rooms is reserved at the Proximity Hotel for February 12. The negotiated rate is $199 plus taxes for a Loft King room. Reserve your room using this link or call (336) 379-8200 and identify the group name, 2019 President/Chancellor Forum. Twenty-five presidents, along with key administrators, spent a full day learning, sharing, and recommitting to preparing students for democratic citizenship and reinvigorating higher education for the public good. Following a welcome from President Allen, the annual NC Campus Compact Engagement Awards were presented. Thanks to the Piedmont Service Group, our 2018 Awards Sponsor and Aramark, our 2018 Resource Sponsor. 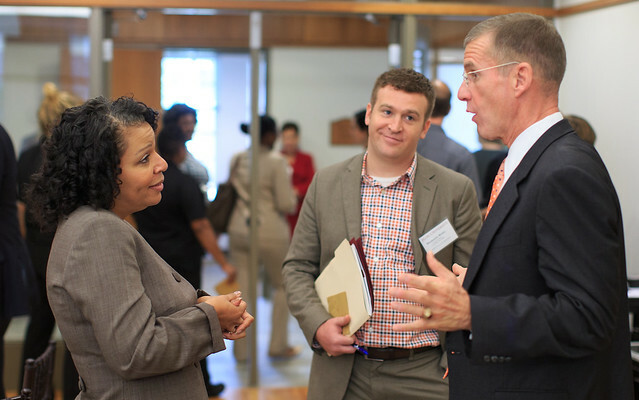 The 7th annual NC Campus Compact Presidents Forum welcomed 35 college and university presidents and 30 other campus officials, including Chief Diversity and Equity Officers. The morning began with a celebration of NC Campus Compact's 15th Anniversary, including the inaugural screening of the 15th anniversary video, featuring student leaders as well as NC Campus Compact founding President, Leo Lambert, Elon University, and Chancellor Mary Grant, UNC Asheville, Vice-Chair of the national Campus Compact Board and member of the NC Campus Compact Executive Board. At the conclusion of the Awards Ceremony, High Point University President and NC Campus Compact Board Chair, Nido Qubein, announced a surprise $200,000 Challenge gift from High Point University to NC Campus Compact to establish an endowment. Learn more. Jamie Merisotis, President and CEO of the Lumina Foundation, delivered the morning keynote on "What Now": North Carolina's Opportunity to Reimagine Postsecondary Education" sharing insights from his 2015 book, "America Needs Talent: Attracting, Educating & Deploying the 21st-Century Workforce." In addition to redesigning postsecondary education, he suggested reinvigorating the private sector, redefining the federal role, and reimagining immigration in order to address the talent gap between available jobs and those prepared for them. In the afternoon Dr. Alicia Dowd, professor of education at Penn State University’s Center for the Study of Higher Education, discussed "From Diversity to Equity: Engaging the 'Race Question' in Higher Education." She shared examples from her 2015 publication "Engaging the "Race Question": Accountabilitiy and Equity in U.S. Higher Education" which included lessons learned from implementation at multiple colleges and universities around the country of the Equity Scorecard, which she helped co-create. A panel followed, moderated by Chancellor Martin, featuring Presidents representing various sectors of higher education. They discussed ways they are promoting equity and inclusion within their unique contexts. Dr. Andrew Seligsohn, President of Campus Compact, delivered the closing keynote on "Why Our Students, Our Communities, and Our Democracy Need Us to Change Our Intitutions." NC Campus Compact member presidents attended a reception the night before, hosted by Chancellor Martin at the International Civil Rights Center and Museum in downtown Greensboro. Thank you to Blue Cross and Blue Shield of North Carolina and Aramark Facility Services for their sponsorship of the 2017 Presidents Forum. "Partners in Progress: Presidents, Institutions, and Communities"
The 6th annual NC Campus Compact Presidents Forum on February 10 welcomed 30 college and university presidents and chancellors, along with 20 other top campus administrators. The Forum agenda included presentations by national experts on higher education engagement, a panel of NC Presidents, and a conversation with NC Governor Pat McCrory. Gene Chasin, chief operating officer of the national non-profit Say Yes to Education, shared his perspective on the group’s new partnership with Guilford County Schools to provide last-dollar funding for public school graduates attending college in NC. Steve Dubb, director of special projects at the Democracy Collaborative, shared his research on the role of anchor institutions. A trio of leaders – ECU Chancellor Steve Ballard, Wake Tech President Stephen Scott, and Warren Wilson College President Steven Solnick – discussed their experience institutionalizing and expanding civic and community engagement at their respective campuses. In a conversation and Q&A moderated by High Point University President Nido Qubein, Governor McCrory discussed the crucial role higher education plays in NC’s future, as well as top priorities for the state. "Creating a Culture for #ServiceYear in North Carolina"
Click on the photo below to scroll through the gallery. Retired General Stanley McChrystal, the former commander of U.S. and International Security Assistance Forces in Afghanistan and the former commander of the nation’s premier military counterterrorism task force, Joint Special Operations Command, served as the keynote speaker. McChrystal currently serves as chair of the Franklin Project at the Aspen Institute. The project aspires to create a 21st century national service corps that acts as a counterpart to military service in the United States. Its goal is to foster 1 million civilian service opportunities that will provide every American between the ages of 18 and 28 the opportunity to complete a fully paid, full-time year of service in organizations. To realize this vision, the Franklin Project engages Americans from the private sector, higher education, government, the military, the faith community, and philanthropic and nonprofit organizations to develop innovative policy ideas and to build momentum around advancing a new vision of civilian service. Throughout the day participants shared ideas and discussed ways service can be incorporated into higher education. Concepts range from pre-college gap years, to mid-college time off, to a year of service after graduation. Leaders put forward ideas for engaging students, generating campus support for service opportunities and seeking the financial support to implement those endeavors. Chancellor and Mrs. Miller hosted a reception for Presidents on February 4 at Kenan House. Photo: Members of the NC Campus Compact Executive Board (Leo Lambert, Elon; Jo Allen, Meredith; Ken Peacock, Appalachian State University; Nido Qubein, High Point University; Kyle Carter, UNC Pembroke; James Anderson, Fayetteville State University; Gary Miller, UNC Wilmington; Lisa Keyne, NC Campus Compact) Photos by: Jeff Janowski/UNCW. "Intensifying Engagement: Presidents talking to Presidents"